What are Ukrainians willing to do in order to preserve the environment? According to survey conducted in November-December 20181, an absolute majority of respondents agree with the statement that environmental problems directly affect their everyday lives and health. At the same time, environmental problems, as well as the environment in general depend not only on the authorities, adopted norms, international standards, etc., but also on the activities of each of us. What are Ukrainians willing to do to reduce environmental pollution and prevent the occurrence of adverse consequences of pollution? 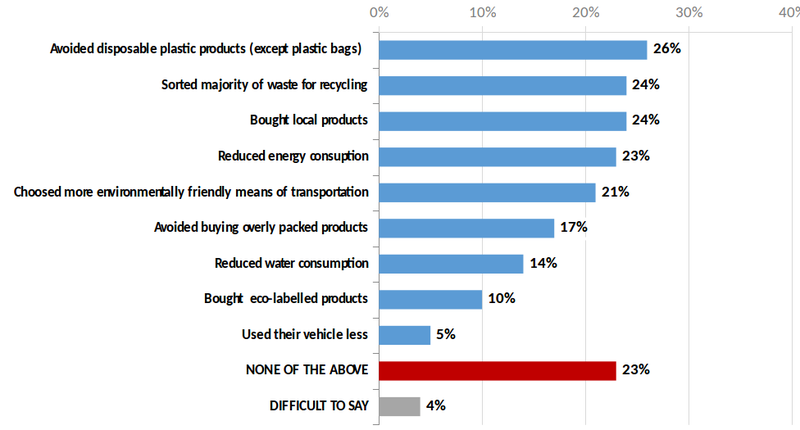 To reduce the adverse impact on the environment caused by personal activity, Ukrainians try to use disposable plastic products less, sort waste, reduce energy consumption, prefer local products and do not buy overly packed products, choose more environmentally friendly means of transportation and more (see Figure 1). In addition, Ukrainians are willing to insulate their houses/apartments and buy energy-saving appliances, use light and water more effectively and participate in public works (volunteer clean-up, cleaning, etc.) (see Figure 2). Figure 2. Data of survey conducted in 2016. 2016 respondents aged from 18 and over were interviewed in all regions of Ukraine, with the exception of the Autonomous Republic of Crimea and occupied territories of Donetsk and Luhansk regions2. What people are ready to do to improve the environmental situation? At the same time, a significant part of respondents keeps carrying out activities that cause harm to the environment. This being said, over 43% of respondents admitted that they burn dry vegetation, falling leaves and domestic waste near their houses (in the garden or near the country cottage), thus polluting the atmosphere3. Nevertheless, every year, the number of people who are ready to take active steps to prevent environmental damage increases. Thus, the number of people who say that they clean up after themselves when spending time in open air, in 2016, increased by 12 % compared with 20154. A clean environment is a determinant for a healthy future for each of us. Stay active, save the environment together! 1 The survey was conducted by Kyiv International Institute of Sociology ordered by International Charitable Organization “Environment-People-Law”. As part of the study, 2034 interviews were conducted with respondents living in 110 localities of Ukraine. The questions were taken from the questionnaire of the Eurobarometer international comparative research project (Special Issue).